Deutsche Telekom and Telefónica Deutschland have partnered to speed up the expansion of their mobile communications networks, as they look to upgrade to 5G in the coming years. The deal significantly expands a current agreement between the two firms and will see them consolidate their infrastructure in Germany as mobile traffic and data demands continue to climb. 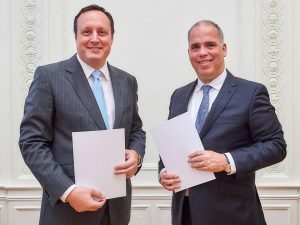 In the long-term, the companies plan to connect at least 5,000 Telefónica Deutschland mobile base stations with Deutsche Telekom’s fiber-optic network. Deutsche Telekom will then use the money it saves through the deal to expand its own network. “This agreement is an important step towards ensuring the future viability of Germany’s mobile communications infrastructure,” said Dirk Wössner, managing director of Telekom Deutschland. He said that Deutsche Telekom will put the synergies created by the deal back by into network upgrades and 5G development, claiming that “everyone will win from this co-operation”. Telefónica Deutschland CEO, Markus Haas, described the agreement as “an important milestone” for network expansion in Germany. “By using the available infrastructure, we can accelerate the expansion of our mobile network and get a significant portion of our mobile base stations in shape for the future 5G standard,” he said. The new deal builds on a mobile backhaul agreement that was struck by the two companies in 2011 and will pave the way for upgrading current 3G and 4G base-station antennas to 5G in the coming years. The two mobile networks will continue to exist independently of one another and Deutsche Telekom will be responsible for operating and monitoring the fiber-optic network.